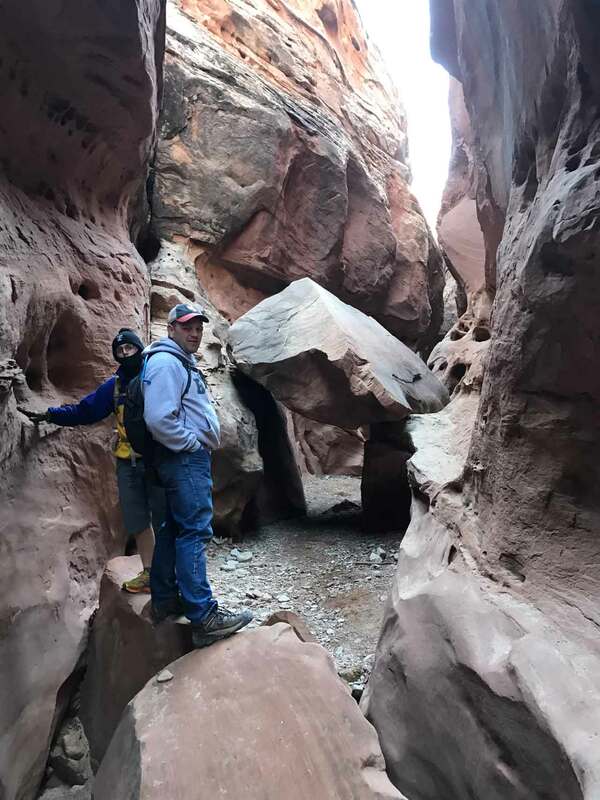 After a couple months of cold, snow, and Winter, you need to get out and get some adventure and hiking Little Wildhorse Canyon was the perfect get away for us in early February. 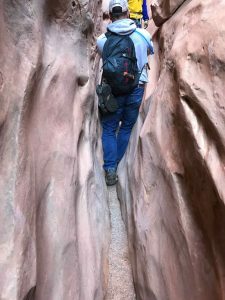 In addition to an awesome hike, you are only about 5 minutes away from a visit to Goblin Valley State Park it you want to go for a two-for. 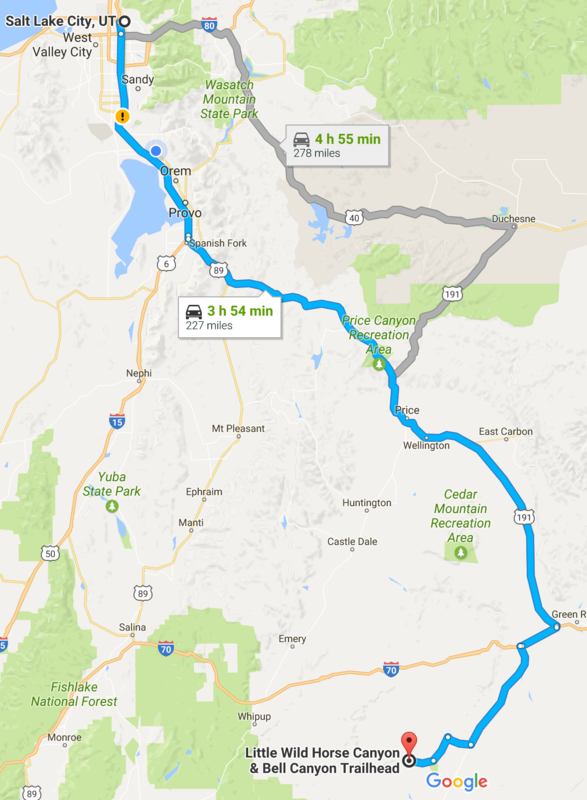 At about 3 and a half hours’ drive from SLC, Little Wildhorse Canyon is within reach for a quick overnight adventure or for a longer day if you get started early. Take I-70 west from Green River about 9 miles to Hwy 24. Head south on Hwy 24 and follow the signs to Goblin Valley State Park until you begin to see signs for Little Wildhorse Canyon. 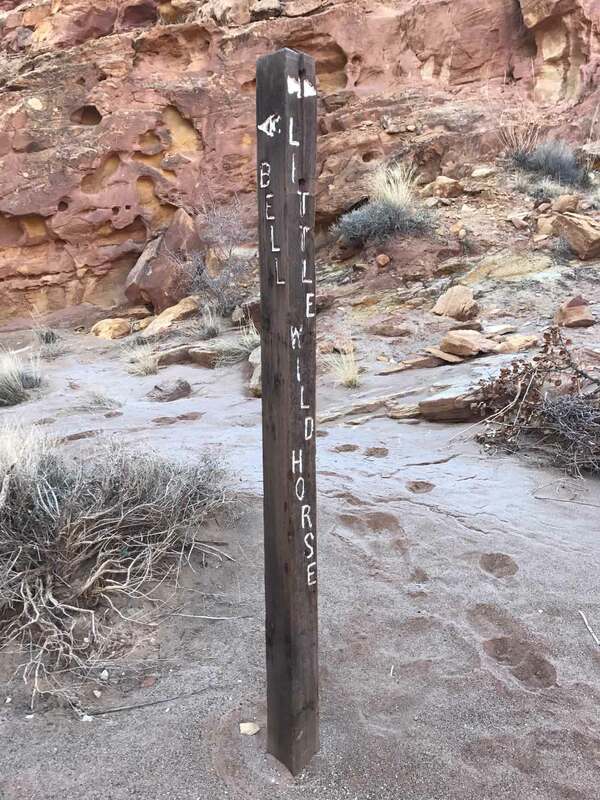 From there, follow the signs to Little Wildhorse Canyon. The roads were paved and in great condition all the way up to the dirt parking lot at the trailhead. In order to give ourselves for time for exploration, we chose to drive down on a Friday night and camp overnight on some nearby BLM land. Remember to clean up after yourself so that the area remains awesome and beautiful. We found that the soil was really soft with very few rocks which made for a softer ground to sleep on. There was a herd of cows nearby. Watch where you step. 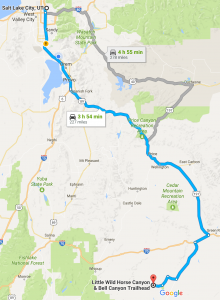 There is also camping available at the Goblin Valley State Park as well as a KOA campground in Green River. The Trailhead is at about 5000 feet in elevation with a total gain of about 600 feet over the hike. 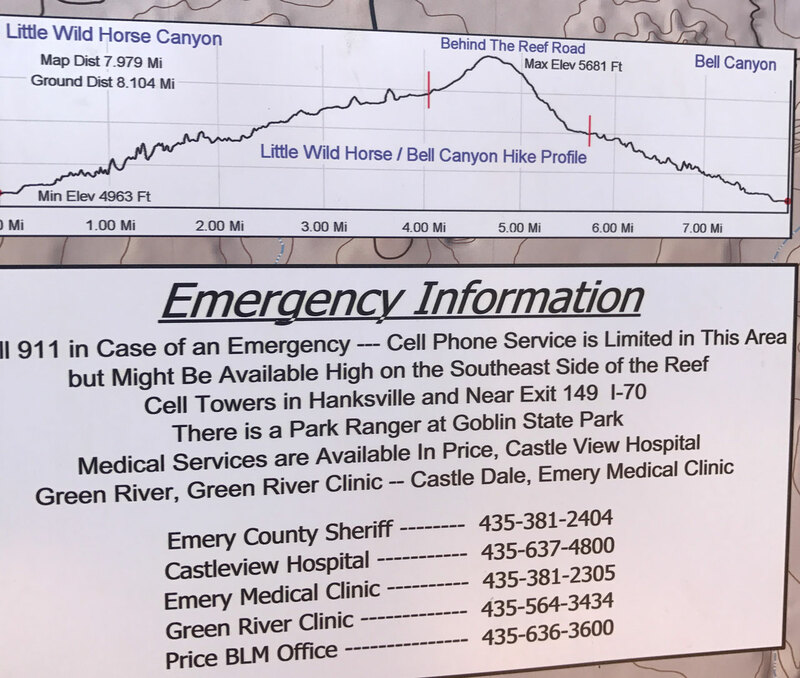 At the trailhead, you will see the typical informational signs including maps and elevation graphs along with emergency contact information. 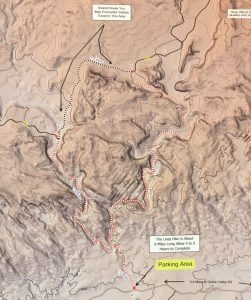 The typical measurements for the hike are about 4 miles up Little Wildhorse Canyon, about 2 miles traversing from the top of Little Wildhorse to Bell Canyon, and then about 2 miles descending Bell Canyon. As far as elevation, you begin at about 5000 vertical feet and gain about 600 total feet with the highest point in the traverse between the two canyons. Typical of a Utah slot canyon, there are so many cool things to explore in the canyon with various terrain changes, with open canyons, skinny and tight slots, walls pocked with eroded holes, water pools to wade through, snow in the winter, heat in the summer, and hikeable most months of the year. 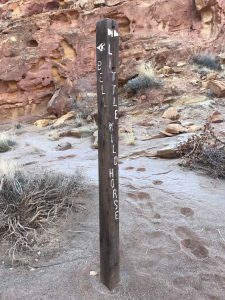 mile into the hike you will encounter a fork in the canyon with Bell Canyon going straight ahead and Little Wildhorse Canyon turning off to the right. We took the turn up Little Wildhorse to the right. The canyon will turn about another 90 degrees to the right before the canyon begins to get skinny and tight and fun. The grooved lines etched into the sides of the canyon give unreal views, awesome photos a few tight fits. After a couple of miles up the canyon (remember, it was early February), we encountered about 50 feet of ice water that we had to wade through. No matter, we had some neoprene socks and some water shoes. 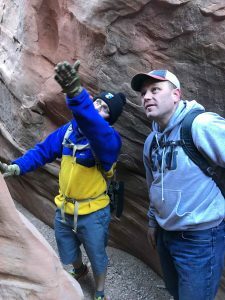 A bit further up the canyon, we began to enounter 2-4 inches of snow all over the ground and a few areas of dense and slippery mud. 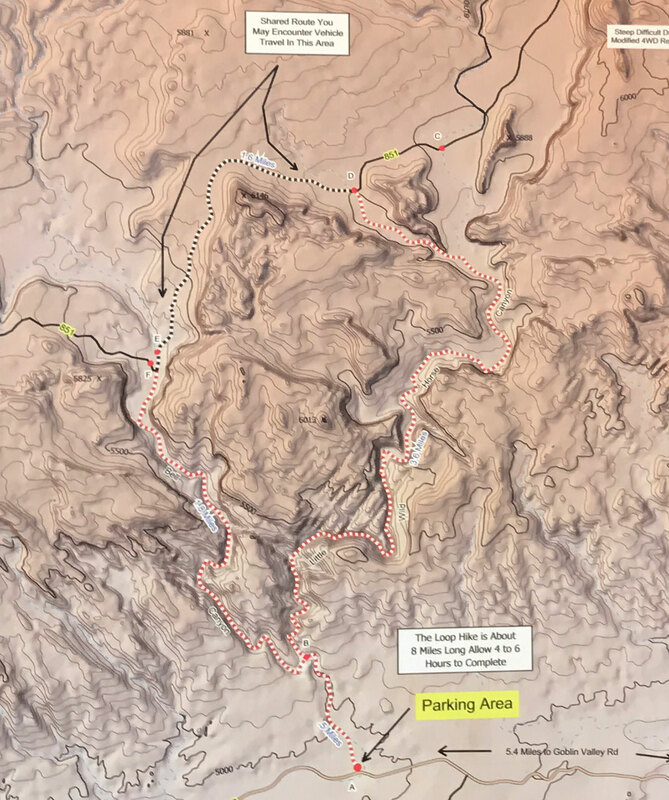 The traverse from the top of Little Wildhorse Canyon is basically following a fairly rough, sandy, and sometime muddy road up the hill to the left and then descending quickly down into the opening of Bell Canyon. Bell Canyon is a quick 2 mile descent with a few obstacles and a couple of tight spots. Overall, this is an excellent hike if you like a little boulder scrambling, a bit of water and a lot of adventure. Little Wildhorse Canyon has Plenty of Fun Obstacles to Maneuver. There are some inherit dangers in hiking Little Wildhorse Canyon that you will need to be prepared for. First, be prepared for the weather. In the summer months, it can get quite hot and dry. 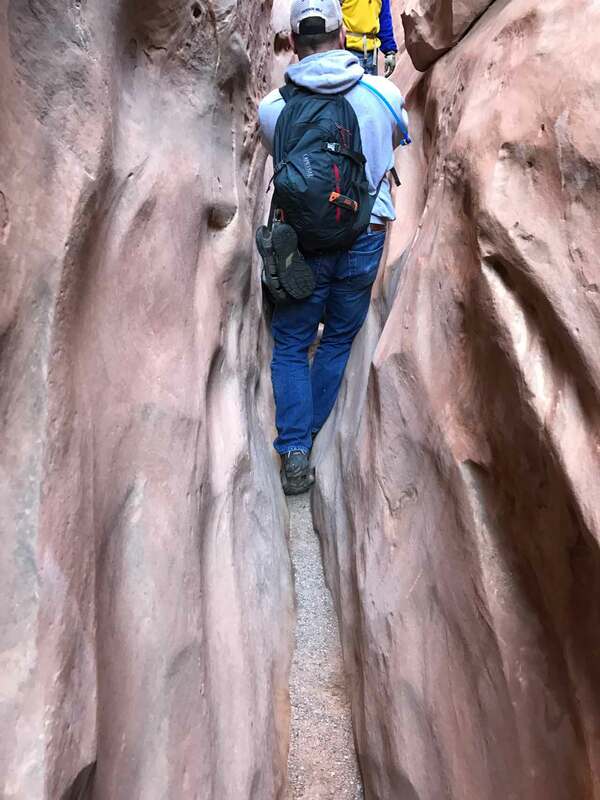 Be prepared with plenty of water, sunscreen, sunglasses, etc… If there is rain in the canyon or even miles away, because you are in a slot canyon, you could get washed out. Be sure to know the weather. In the winter, it can be quiet cold with snow, ice and freezing water to wade through. Be prepared for that also. 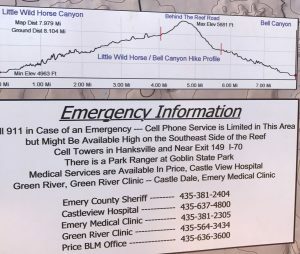 You will be out of mobile phone range the entire hike, so be sure that you don’t enter alone so somebody can go for help.